Zainab Kamara is a Giraffe Hero for sticking her neck out to become a powerful voice for the disabled in Sierra Leone, mobilising the physically challenged to stand up against violence, abuse, economic exploitation, and any other form of discrimination. The vulnerability of the disabled and physically challenged to exploitation in both the urban and rural communities in Sierra Leone is even more severe for women, who are still treated as less equal to their male counterparts due to cultural bias. Kamara pushes government to invest more in dealing with the challenges of the country’s disabled, made huge by a decade of vicious civil war. She’s a fierce advocate for improving conditions of living, health and justice for the disabled, including, shelter, means of livelihood and social and human rights. Kamara is disabled herself, shot on January 6th 1999 during the civil war when she was eighteen years old. “I felt a sharp cold down my spine, and a few seconds later I knew I’d been shot. The next moment I was rushed to a hospital for an operation,” says Kamara, recalling the circumstances that led to her disability. To this day, she doesn't know who shot her but believes it must have been a stray bullet. The horror of such a moment still shows on Kamara’s face when she recalls her worst nightmare in life. Though she survived, she has since been confined to a wheelchair. That horror did not dampen her spirit. 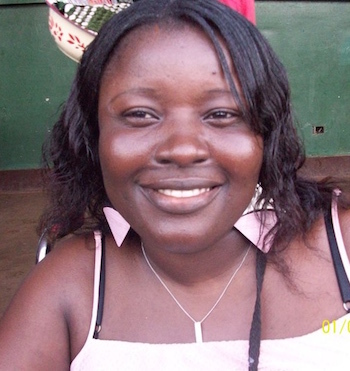 Kamara went on to pursue her first degree in History and Political Science at Sierra Leone’s Fourah Bay College, University of Sierra Leone. After graduation, she began her advocacy for the disabled. She started Empowerment for Disability and Social Integration (EDSI) to help the disabled advocate on human rights issues and to gain access to formal education. EDSI calls on government to improve conditions of livelihood for the disabled community, to reduce abuses, and to remove barriers to accessing justice and social amenities. Above all, Kamara began looking for ways to build the capacity of the disabled so they can lead fuller, more productive lives. EDSI is also active in raising public awareness of the challenges faced by he disabled and by calling on communities to report any rights abuses to the Police and other agencies. In January, 2016 Kamara went on radio, using her own story to call for changes in attitudes towards issues affecting the lives of the disabled. During the Ebola outbreak in 2014, Kamara led visits to communities of disabled in western Sierra Leone to raise awareness of the disease, to show people how to keep safe, and to urge them to report early for treatment when sick. In doing this she visited high-risk areas, risking her own life. There are other dangers—especially from threats from those Kamara has exposed for exploiting the disabled.